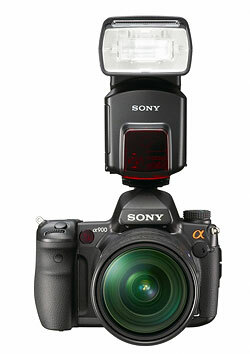 Thanks to its huge pentaprism, the Sony A850 has no built-in flash. (Sony felt it simply would have added too much bulk to an already large bulge on the camera's top. Plus, with some of the large full-frame lenses is likely A850 to be used with, a built-in flash would be bound to have problems with shadowing.) So the only option for flash on the Sony A850 is an external unit. In that, you'll largely be restricted to Sony-brand flashes, at least if you want an intelligent flash that interacts with the camera's exposure system. (Although there are third-party units offering varying degrees of compatibility.) 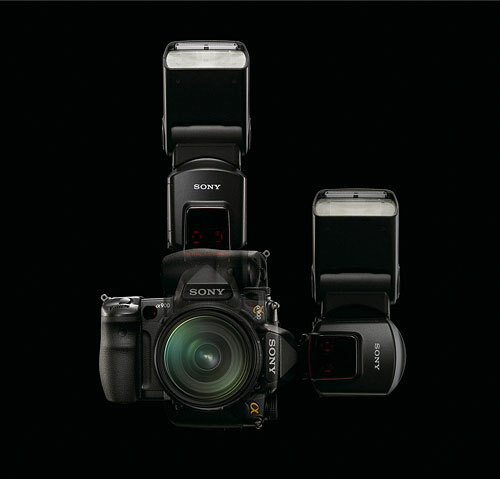 The Sony flash shoe is a proprietary design unlike the common hot shoe seen on other camera brands. The good news though, is that Sony offers a good range of dedicated flash units, from the top of the line HVL-F58AM (seen at right, mounted on top of the A900) down to the entry-level HVL-F36AM (still not cheap at $199 list). Even better news is that all current Sony flash units have wireless capability, so you can combine them into complex lighting setups, with multiple off-camera flashes all controlled from the camera. One of the more interesting design aspects of the new HVL-F58AM deserves mention. The heads on most external flash units tilt up and down for bounce operation off the ceiling for even illumination and also swivel to let you bounce the flash off a side or back wall for special lighting effects. But what about when you're holding the camera in portrait (vertical) orientation? The head that would previously tilt up to bounce off the ceiling will now only point to the side. You might be able to swivel it to point back up at the ceiling, but your control over the bounce angle won't be as good as when in normal landscape mode.